Yummell is a game for 2-8 players, though according to my wise judgement the optimal number is 5. Remember that the more players you have, the longer the game will last (but it will be even more fun!) To start playing, prepare the following. Assign characters. Each player is assigned a character. They can be chosen by mutual agreement amongst the players or randomly. With the latter situation, put the pawns depicting the eight characters in the bag and then extract one per player. As a result of this reckless action, each player will be assigned the character on the pawn. Each player then places the corresponding character sheet in front of him so that it is visible to other players. Assign Advantage. Advantages also are assigned randomly. Shuffle the Advantage cards and have each player draw one. He/she will place the Advantage card next to the character sheet. 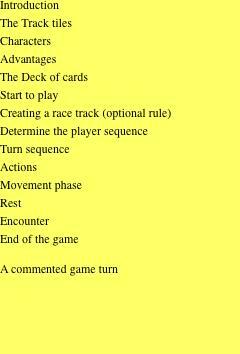 Assigned Advantages shall always be visible to the other players, who will be able to consult the card. Choose the Track. If you are novice players, or you want to try out tracks that have already been prepared. If you want to experience the thrill of creating a track, follow the optional rule. Hand out the initial cards. Shuffle the deck of cards. Each player draws 4 cards from the deck, without showing them to the other players.